Read what 11-year-old Paula wrote in her letter about climate change. During the United Nations General Assembly this week, the President of Austria personally delivered to US President Donald Trump a letter written by an 11-year-old girl from Vienna, Austria. Austrian President Alexander Van der Bellen also shared a picture of the letter on Facebook, where it has gone viral with over 10,000 reactions. 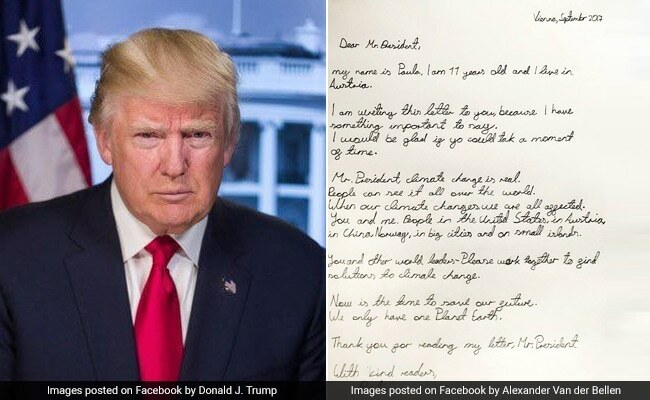 "Mr President, climate change is real," writes 11-year-old Paula in her letter to Mr Trump, who has often denied climate change and called it a 'hoax'. Paula goes on to urge Mr Trump to recognize climate change and find solutions to it along with other world leaders. "We only have one planet earth," she concludes. According to Kurier.at, Alexander Van der Bellen handed the handwritten letter to Donald Trump during a Meet & Greet reception for all heads of state and government during the UN General Assembly. Since being shared on September 20, the letter has also found its way to Reddit, where it has been 'upvoted' close to 5,000 times. In June this year, Mr Trump's decision to back out of the Paris climate agreement had invited widespread criticism.